Despite government claims of economic progress, hunger and poverty stalks the metropolis. In fact, some five million Filipinos admit in a survey that they can barely afford three square meals a day and often go hungry. To partly address this problem, the Precious Heritage Ministries Foundation has instituted a Feeding Program for the children ages 3-10 years old with nutritional meals daily. These children are from the poorest families living in the squatters area in Metro Manila and the neighboring provinces. 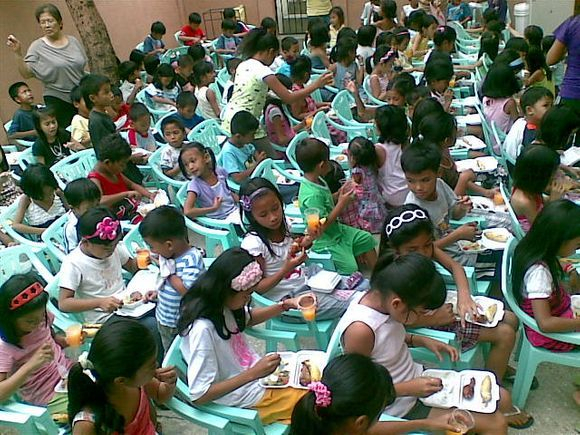 The Feeding Program aims to put into practice the admonition of Jesus Christ for Christians to feed their hungry. Believing that the poor also deserves decent meals, Precious Heritage Foundation has been actively distributing food and vitamins to ease a critical malnutrition problem that affects 6.3 million children across all regions in the country. Senator Angara, quoting a National Nutrition Survey done in 2003, said that a total of 2.9 million school children were found underweight while another 3.4 million were growth-stunted. "The 6.3 million school children come to class listless, unprepared and unenergetic, perhaps ready for only one thing and this is to join the swelling armies of under-performing Filipinos". Angara said that the malnutrition problem, which cuts across all regions, has "brutal and irreparable effects on children and is one of the country's biggest tragedies." You can partner with us through sponsoring one meal of our regular feeding program in the amount of P2,500/$30 for 50 children. If you are interested please email us and we would gladly accept you as our partner in giving these children a brighter hope and future.